At night from January 14 to 15. Traditional dances like Dengaku are performed. These dances are said to preceede the Noh and Kyogen performances of later times. Loads of snow are made to the deities of the shrine. If it snows on this day, the harvest of the coming year will be good. More than 19 masked dancers take part in the performances. One rides a paper horse., another a paper cow and others. 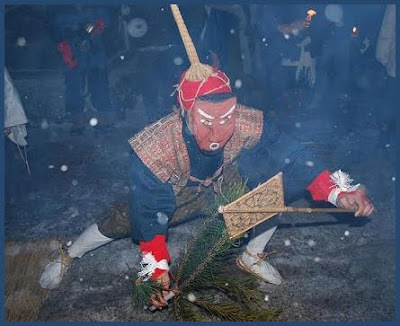 The festival of Niino is very rare as well as Sakanbe winter festival. Dengaku and Sarugaku, original forms of Noh dances, are held all night through. 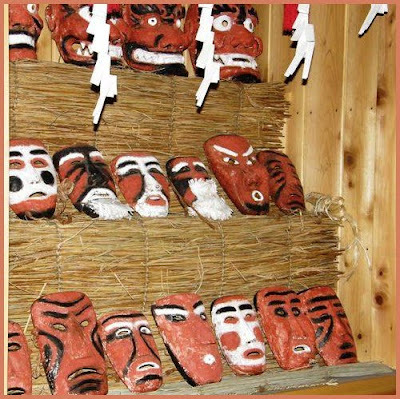 The fabulous masks look like Picasso’s paintings. The most important god is Saiho who dances in peculiar fashion purifying rice seeds and promising good harvest. Modoki, a partner of Saiho, plays comical role. Modoki derived from an old Japanese verb “modoku” or mimic. We got a best of luck of heavy snow! Yukimatsuri was earlier called Dengaku matsuri. Winter Festival in Sakanbe (Sakabe) . 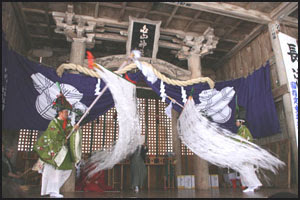 the dengaku dances that developed in conjunction with sangaku. 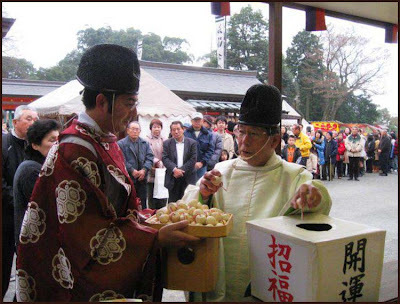 A ceremony to invite a good harvest for the coming year. two men clad as farmers, wearing simple masks, and one man clad as a woman called "oyase おやせ" walk around the village, from home to home, to perform the movements of rice planting. The woman wore a round basket with special shime decorations on her head. She also wore a special red robe, usually for a wedding ceremony. 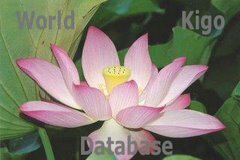 This was thought to invoke the plants to grow strong and healthy. 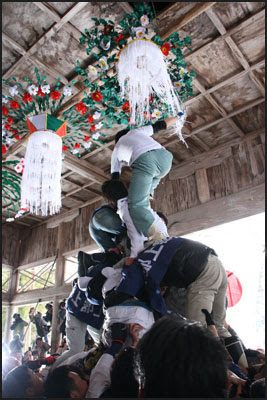 This ritual had been performed until around 1905, when it was abolished.
. WKD : planting rice in the paddies, taue 田植 .
. Aichi Prefecture - Festivals . 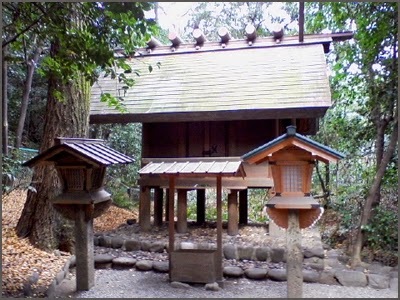 is a Shinto shrine traditionally believed to have been established during the reign of Emperor Keikō (71-130) located in Atsuta-ku, Nagoya, Aichi Prefecture in Japan. 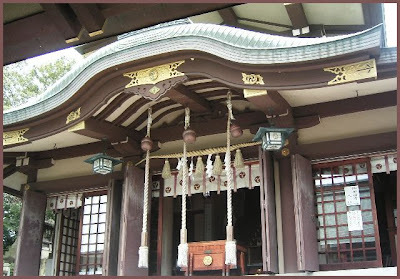 The shrine is familiarly known as Atsuta-Sama (Venerable Atsuta) or simply as Miya (the Shrine). 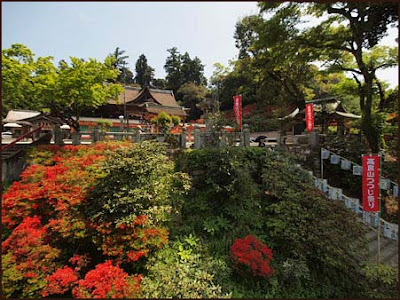 Since ancient times, it has been especially revered, ranking with the Great Shrine of Ise. Kusanagi no Tsurugi 草薙の剣 . According to traditional sources, Yamato Takeru died in the 43rd year of Emperor Keiko's reign (景行天皇43年). The possessions of the dead prince were gathered together along with the sword Kusanagi; and his widow venerated his memory in a shrine at her home. Sometime later, these relics and the sacred sword were moved to the current location of the Atsuta Shrine. 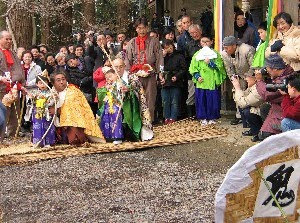 Nihonshoki explains that this move occurred in the 51st year of Keiko's reign, but shrine tradition also dates this event in the 1st year of Emperor Chūai's reign. From 1872 through 1946, the Kasuga Shrine was officially designated one of the Kanpei-taisha (官幣大社), meaning that it stood in the first rank of government supported shrines. 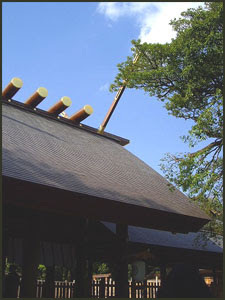 Over 70 ceremonies and festivals are held annually at the shrine. Seeking good fortune in the new year from Ebisu, the God of Fortune. The projected annual rainfall for the coming year is prophesized by measuring the amount of water in a pot kept underneath the floor of the Eastern Treasure House. Ceremony which involves shooting an arrow at a wooden piece called chigi fixed at the center of a huge mark. A ceremonial dance from the Heian era is performed outdoors on a red painted stage. 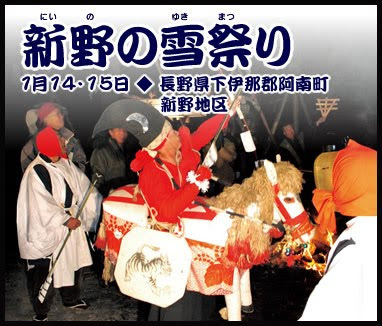 A festival to commemorate the return of the sacred sword in the reign of Emperor Tenji. A festival in which portable shrine (mikoshi) is carried in a formal procession to the Western Gate, where ceremonies and prayers for the security of the Imperial Palace are performed in the open air. In the Meiji period and Taisho period, this procession moved in sober and solemn silence. 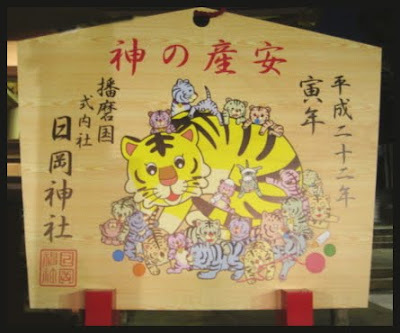 The ceremony at the gate was brief, lasting only 20 minutes; and then the mikoshi and its attendants returned into the Shrine precincts. Shogun Ashikaga Yoshimasa provided a new mikoshi and a complete set of robes and other accouterments for this festival on the occasion of repairs to the shrine in the 1457-1459 (Chōroku 1-3). shoobu matsuri 尚武祭（しょうぶまつり）"military arts festival"
The main festival of this shrine, on June 5. It used to be on the fifth day of the fifth lunar month, like the tango seasonal festival. Portable tabernacles (mikoshi) in various styles are carried along the approaches to the shrine; many mikoshi are carried by children, who parade to the sound of drums and bamboo festival flutes. 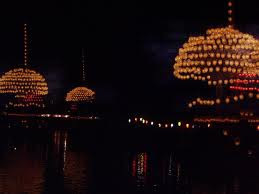 At night, groups of 365 lanterns on huge boats (makiwarabune) float down the river and are then displayed at the East and West Gate of the shrine. A firework lights the night sky too. 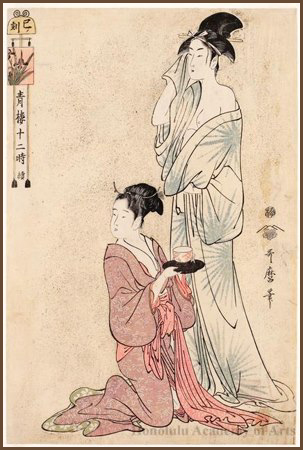 This festival commemorates an Imperial proclamation (semmyō) issued in 1872 (Meiji 5). After 1906 (Meiji 39), exhibitions of judo, fencing (kendo), and archery (kyudo) are presented for the gratification of the kami. Acrobats, artists and dancers join the parade and many stalls sell local specialities along the road. On this day, the shrine dance becomes a prayer in movement hoping for bumper crops of the year. 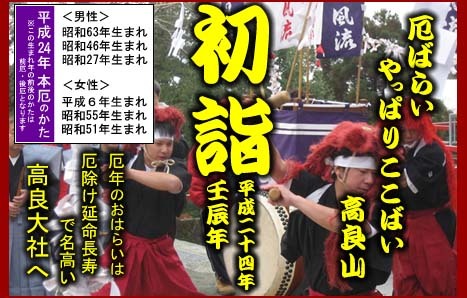 A ritual of the same name is held on January 11 at Atsuta Jingu in Atsuta Ward, Nagoya. 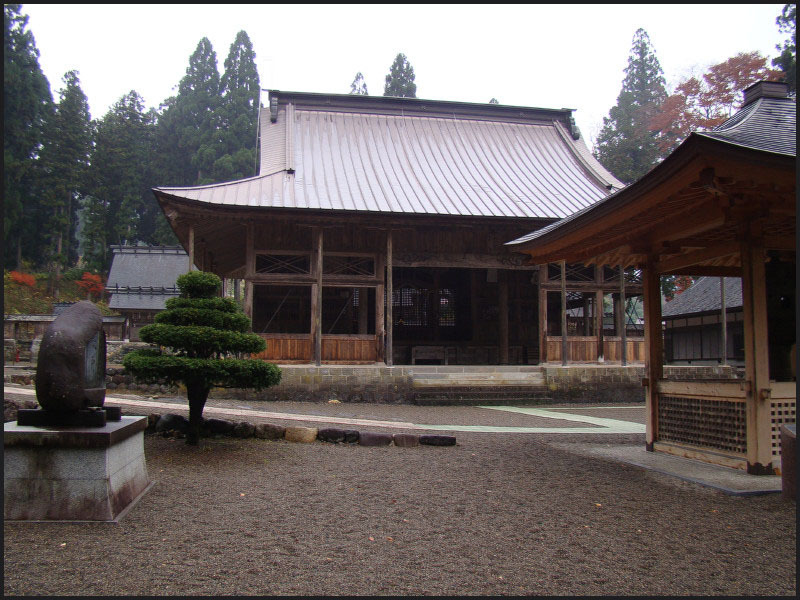 Miya-juku (宮宿, Miya-juku) was the forty-first of the fifty-three stations of the Tōkaidō. It is located in the Atsuta-ku section of the city of Nagoya, in Aichi Prefecture, Japan. It was six km from Narumi-juku, the preceding post station. 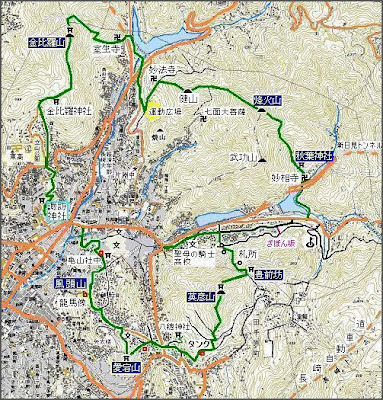 In addition to being a post station on the Tōkaidō, it was also part of the Minoji (a minor route which runs to Tarui-juku on the Nakasendō) and the Saya Kaidō 佐屋. 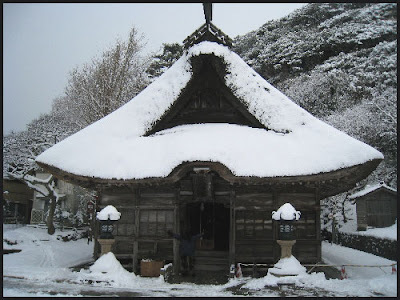 As a result, it had the most hatago lodgings of any post station along the Tōkaidō, in addition to its two honjin main lodgings for feudal lords.
. 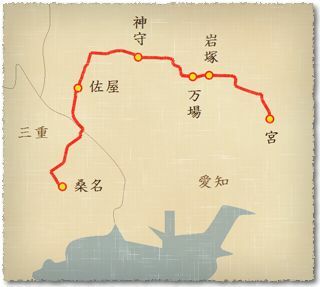 The 53 stations of the Tokaido 東海道五十三次 . From Atsuta there were two possibilities to reach the next station, Kuwana. One was via Saya and then by boat on the river Kisogawa 木曽川.
. Mizuha no me no kami 罔象女神 / 弥都波能売神 . There was once a samurai with an eye disease. When he washed his eyes with this spring water, he got healed soon. ME no kami　- 目 means eyes. The water helps you obtain a beautiful skin if you wash your face with the spring water. 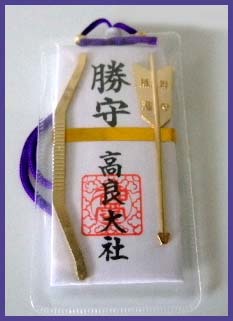 If you pour water on a stone in the spring with a dipper, hitting three times, your wish will come true.
. Amulets for Eye Disease . 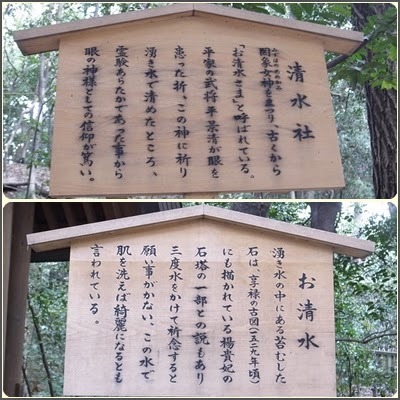 Matsuo Basho visited here on his trip "Nozarashi Kiko" 野ざらし紀行. I went to Atsuta to worship. The grounds of the shrine were utterly in ruins, the earthen wall collapsed and covered with clumps of weeds. In one place a rope marked the remains of a smaller shrine, in another was a stone with the name of a god now unworshipped. All around, mugwort and longing fern grew wild. Somehow the place drew my heart, more than if it had been splendidly maintained. at the inn . . .
. WKD : shinobu, shinobugusa 忍ぶ草 Hare's-foot fern .
. shinkyoo 神鏡 the "divine mirror" . They remind of the mikusa no kamudakara 三種の神器, sanshu no shingi, the famous three imperial regalia. At the shrine in Atsuta, the sword Kusanagi (草薙劍, Kusanagi no Tsurugi) is kept and maybe a replica of the divine mirror Yata no Kagami 八咫鏡.
. - Hayashi Tooyoo 桐葉 Hayashi Toyo - . 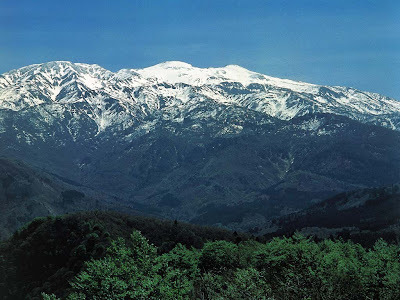 From Atsuta there were two possibilities to reach the next station of the Tokaido, Kuwana. One was via Saya 佐屋 and then by boat on the river Kisogawa 木曽川. Basho choose this road on his last trip to Kamigata. He stayed at the home of Hermit Yamada 陰士山田 on the 25th day of the 5th lunar month in 1694 元禄7年5月25日. Together with other disciples they had a haikai meeting. 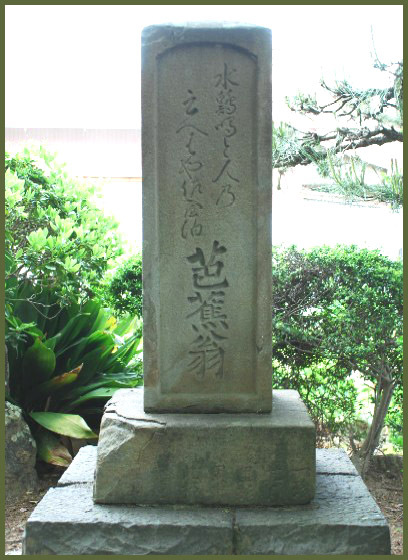 Now there is also a memorial mount with a stone of the Basho poem.